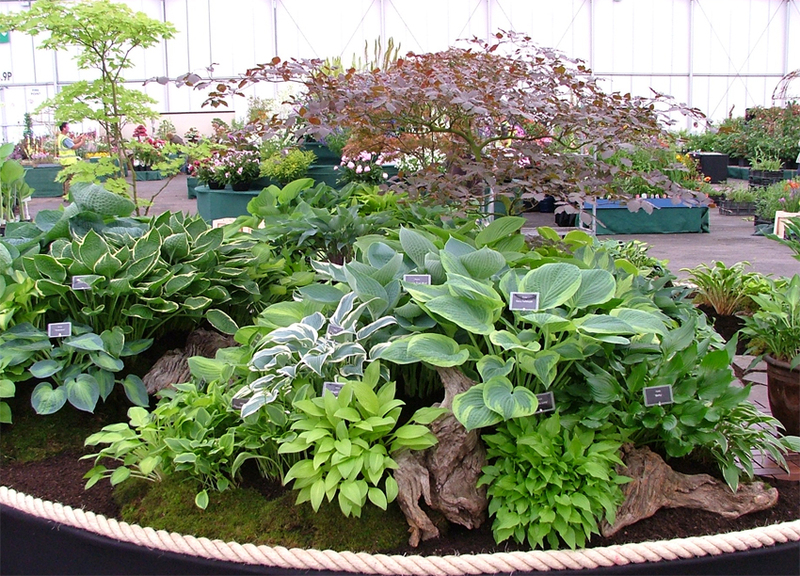 Our recent endeavours at producing displays at flower shows have resulted in some excellent feedback from garden designers, together with Gold and Premier medals and trophies. The only problem is these displays are temporary, so the ideas are lost at the end of the show. 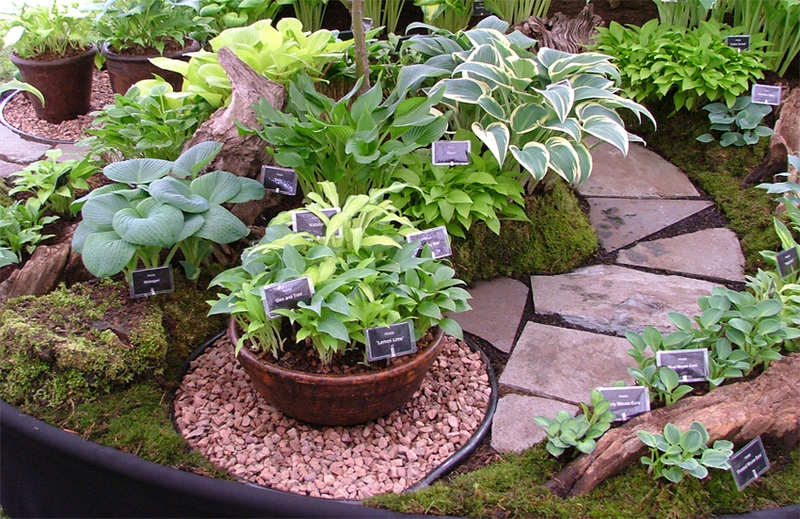 Therefore, we have created this section of the website to share some of the most successful planting concepts and give you some ideas of how to adapt them to your own garden. Sometimes features already exist in established gardens, which can help stimulate ideas on further planting. However, many gardens are blank canvasses, often flat and featureless, especially within newly built estates. This is what we start with at every show, a blank, flat and featureless expanse of board! We have to think about using props, both natural and man-made, to create structure and form but on the right sort of scale. We often use immature trees to help us achieve height but this can also be done using pergolas and shaped trellis. 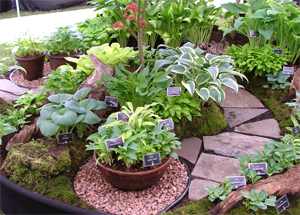 In our 2012 Malvern Spring Flower Show display we created two separate planting areas with a slate path winding between the two. 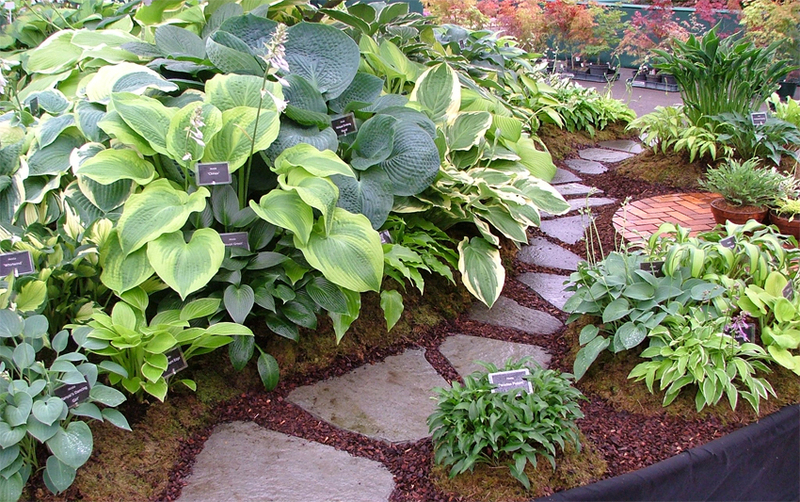 Each end of the path had shingle areas used to display potted hostas. In the right hand image we have used varieties ranging in size from giant down to small. 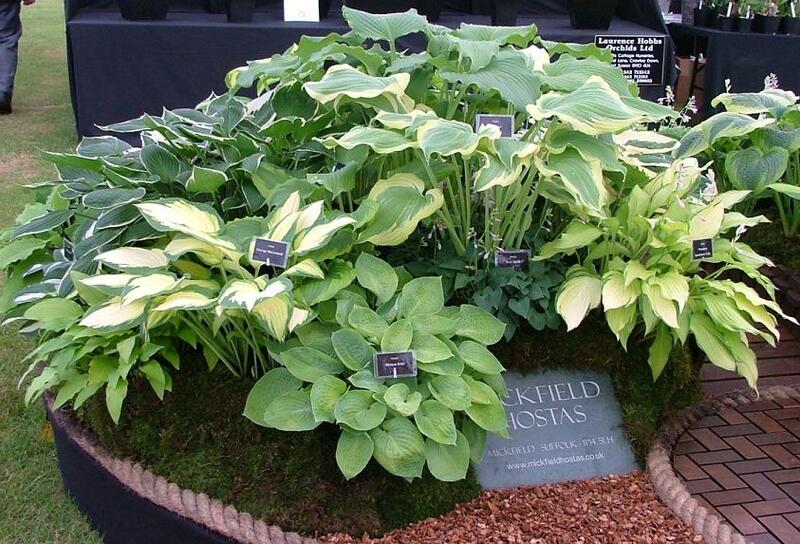 It illustrates how you can underplant more statuesque hostas with smaller varieties to create a cascade of foliage. 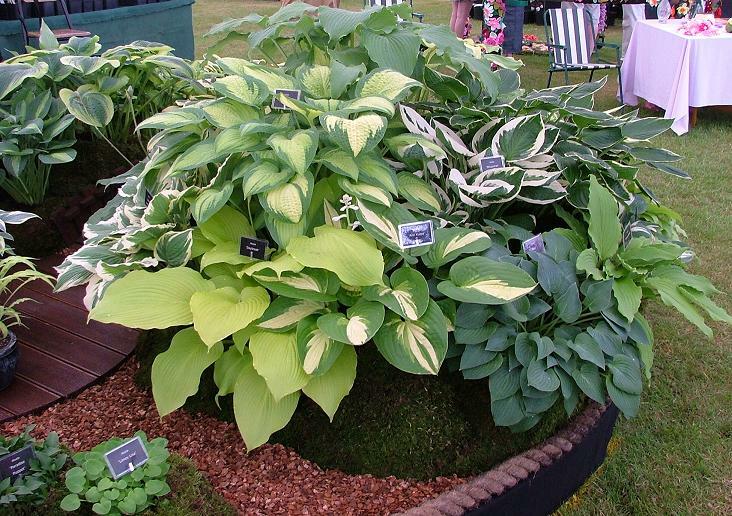 This is a good way to create shade for less sun-tolerant varieties, if you have a more open and sunny garden. 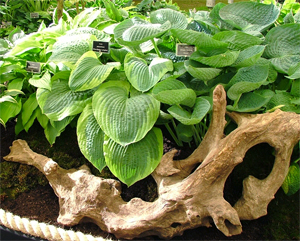 On left: we used the beech to create a curved canopy to draw the eye down the shady, dark gulley between planted beds. Above: another view showing large and small varieties planted together in a mound. 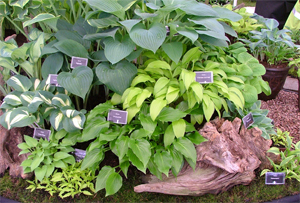 If you click on the left-hand image you will see how effective it can be to plant giant and small varieties together rather than sticking to plants of a similar stature. It is a great trick in smaller spaces and is something you could scale up or down depending upon the space you have. H. 'Olive Bailey Langdon' and H. 'Abiqua Drinking Gourd' emphasised by the wood. This is perhaps easier than starting with a blank canvas because you have something around which to work, whether to cover, hide or enhance. A fellow exhibitor came to us with a large piece of wood, which he could neither fit into his display, or conceal within the parameters of his stand for the duration of the show. We took one look and knew precisely where to put it on our own display, after trying unsuccessfully to underplant H. 'Olive Bailey Langdon' and H. 'Abiqua Drinking Gourd' with any other plants - see photo. Sometimes large-leaved varieties need something much bolder and architectual than other plants to emphasise their habit. This piece of wood could easily have been a partly disintegrated wall or a statue, looking to be softened with planting. 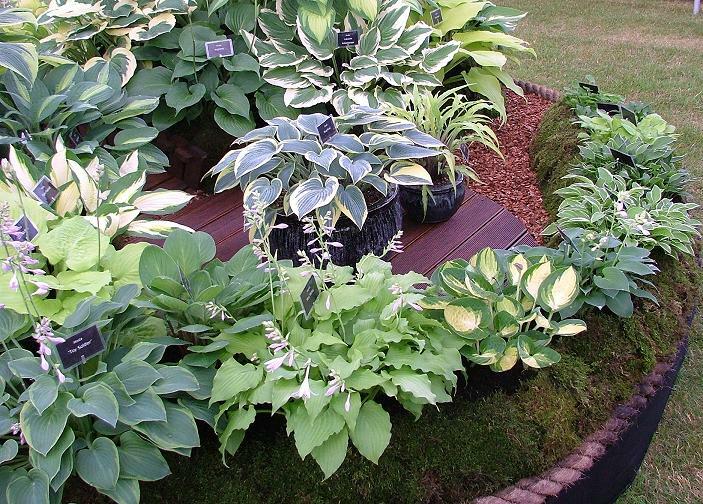 Edging stepped areas with hostas is also a good idea as the soil can be quite banked up. 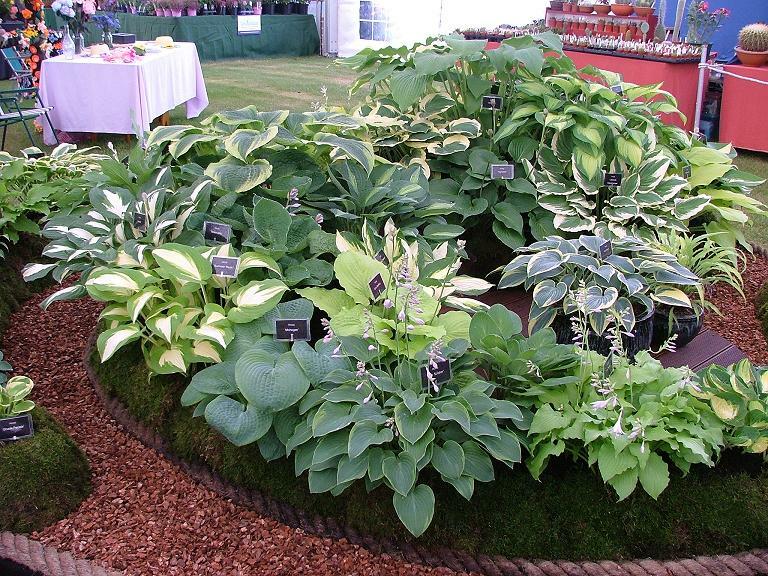 Hostas will help keep the soil in place and they love being planted in banks, alongside ditches or water courses. A dear friend of ours once had a garden in the Clyde Valley in Scotland, which was quite precipitous in places. She grew the most fantastic hostas there. 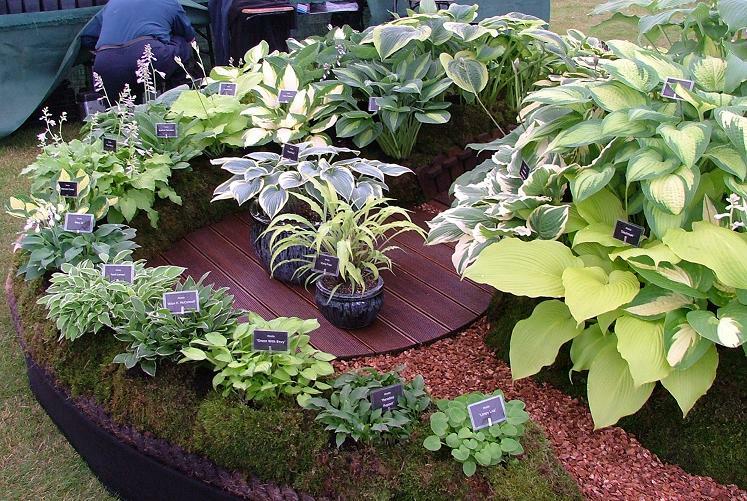 Over the past couple of years we have used decking in some of our displays because it has become very popular with gardeners. Decked areas can look stark if not incorporated into the overall garden scheme, so we came up with a number of ways in which decking could be used to more effect, especially if shapes other than rectangles are used. This display used three decks, each round but of different diameters and placed at different heights. The largest deck was used, on the base of the stand, to create a planted ampitheatre - click on the image to view larger. The medium deck was raised 18" and used at the back of the ampitheatre (unfortunately, the photograph is a little fuzzy to use). This deck we surrounded at the back with upright habit varieties such as H. 'Krossa Regal', to show off their beautiful petioles. The planting continued around that deck and down alongside two wooden steps. 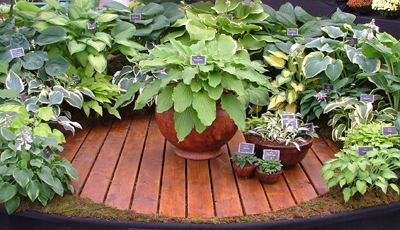 The smallest deck was used to show off some miniature varieties in pots. What we were trying to achieve was to highlight how you can tackle a large area of garden and divide it into areas to plant separately. It is quite a daunting task to set about landscaping a large area in one go, breaking it up into different areas not only helps you to tackle the job a bit at a time, it can also stimulate ideas, which can evolve as you go. So don't let a lack of space thwart plans you may have, it is quite possible to create something interesting in quite a small area. 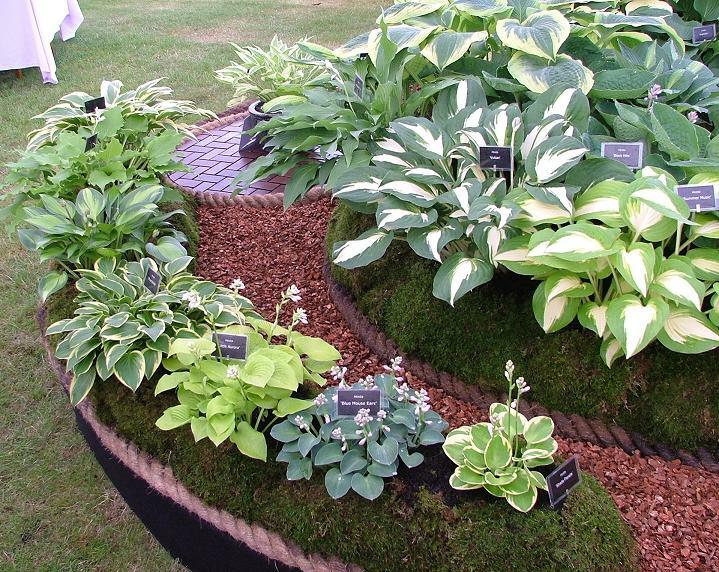 In 2014, we decided to refine the idea of creating a spiral garden in a 12' diameter circle. The idea was to show how you can create something that takes you on a journey round the space. We found customers moving round the stand as their eyes followed the design. We created two main spiral paths, linked by two decks and the wooden bridge. 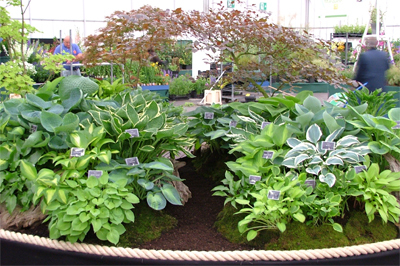 We then selected plants that would add definition to the spaces in between. 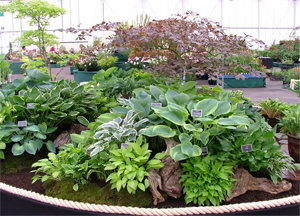 As we get more adventurous with our exhibits, and start on constructing our exhibition garden at the nursery, we will add more photos to this page.